The Oracle of Omaha loves this company's bespoke suits so much, he even did a promotional video - and it shows in the shares. How has the Federal Reserve handled the economic crisis? NEW YORK (Fortune) -- On a visit to Dalian, a city in Northeast China, in 2007, Warren Buffett answered a knock at his hotel room door to find two Chinese tailors. The tailors ran tape measures up his legs and around his waist, and eight minutes later, they departed. Back in Omaha, Neb., three weeks later, Buffett opened a package to find their handiwork -- two custom-made suits that fit him like a second skin. So began Buffett's love affair with Dalian Dayang Trands and its firecracker of a founder, Madam Li Guilian. The Oracle of Omaha now has nine Dayang suits and a tuxedo -- all made by hand of fine Italian wool. Two more suits, plus a sportcoat and slacks, are on order. Buffett's such a fan that he invited Madam Li to Berkshire Hathaway's annual meeting in May, and even filmed a promotional video that Dayang has been running on its website. Buffett's closet -- which used to include suits from the high-end Italian fashion house Ermenegildo Zegna -- is now filled exclusively with Dayang models. "I threw out all my other suits," Buffett says. Buffett is not the only admirer. Bill Gates and Chinese President Hu Jintao have also taken to wearing custom suits by Dayang, as have other Berkshire Hathaway (BRKB) executives, including Buffett's right-hand man Charlie Munger. The made-to-measure suits cost $700 to $5,000, depending on the fabric. Buffett says he is a "special" customer and has so far not received a bill, although he has asked for one. Buffett's unusual turn as a "bespokes"-model has super-sized Dayang shares. (Buffett says he doesn't own any stock in the company.) Since the promotional video he filmed began airing on Aug. 25, Dayang's shares, which trade on the Shanghai Stock Exchange, are up 75% compared with a the composite index, which has remained essentially flat over that period. For Madam Li, who started her company with one sewing machine in 1979, the sudden burst of attention has been a long time in the making. Forced to quit school at a young age, Madam Li, who does not speak English, looked for ways to help her family earn extra money. "They were farmers and very poor," says David Margalit, Dayang's vice president and international marketing director. To start her company, Madam Li recruited housewives in her village to help make tablecloths, aprons, and simple piece goods. Because she didn't have enough sewing machines, she asked her workers to bring their machines from home. Her big break came in 1981, when she got wind that a large U.S. apparel company was looking to place an order for 16,000 corduroy coats with a state-owned manufacturer in Dalian, near her hometown of Yangshufung. The factory declined the order because it came during the Spring Festival, which celebrates the first day of the first lunar month and is considered a Chinese national holiday. Madam Li quickly assembled samples and showed them to the buyer just as he was about to board a plane back to the U.S. She got the order, and her small team worked around the clock for the next month to deliver it on time. In addition to its bespoke business, Dayang today makes 12 million pieces of clothing annually for well-known U.S. retailers, including Macy's (M, Fortune 500), Banana Republic (GPS, Fortune 500), and BCBG Max Azria. It also has about one-fifth of the Japanese clothing market, Margalit says. The company also operates 30 retail stores in China. As of last year, the company earned $8 million on $131 million in sales. Since going public in 2000, the stock has returned 50%. 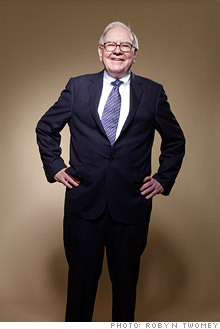 Buffett's 2007 fitting session was arranged by Eitan Wertheimer, the chairman of Iscar, an Israeli supplier of carbon metal working tools of which Berkshire Hathaway owns 80%. Wertheimer and Buffett were in Dalian for the opening of an Iscar factory, and Wertheimer, who had met Margalit through friends, thought it would be nice to spruce up Buffett's wardrobe. Because Buffett was scheduled to arrive at 11 a.m. and have lunch with the Dalian mayor at noon, Wertheimer told Margalit that he would only have a few minutes to take Buffett's measurements. When Buffett met Madam Li later at the opening of the Iscar factory, he was moved by her entrepreneurial story. The suits cinched it. To a sartorial eye, it's not clear whether the Dayang suits with their hand-finished buttonholes would hold their own against the best of Savile Row. But for Buffett, who prefers single-breasted suits, such details are beside the point. Buffett says he likes Dayang suits because they don't "crease, and you could wear them day after day and they look like they just came back from the cleaners." Asked what color suit he was wearing, Buffet said, "Dark -- the kind of suit you would bury a small-time Nebraska banker in." Buffett's suits are mostly pinstriped, but he does have one nod to fashion: a suit with a sharkskin-type finish. "Occasionally," he says, "I have been known to get out."